-- July 2016 - Week 4 -- Baptism - V: The Devil's Fire Blood Region - Of Northern Fire Deftones - Gore Forged in Black - Fear Reflecting Fear Master - An Epiphany of Hate Panzerbastard - MotorHeathen Tanzwut - Schreib es mit Blut Trick Or Treat - Rabbits Hill Pt2. For folks who want to see innovation, jazz scales, and gentle, clean vocals in extreme metal, An Epiphany of Hate is not where you want to look. Master's power-trio death/thrash is pretty much exactly what it's always been: A furious assault as primitive and unchanging as a bull alligator, and far more vicious. 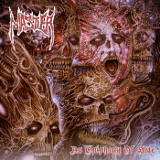 In a time when even some of the great pioneers in death metal are losing some of their rough edges as they age, Master remains as uncompromising as when they started. That lack of compromise reaches from the primitive but relentless pounding the band has perfected. The production is nicely done, emphasizing the drum and bass a bit at the bottom end and letting founding bassist/vocalist Paul Speckmann's vocals blast on top of the guitar riffing. Those vocals are rotting, sneering things, slurring the anarchic lyrics as if they were sung by a zombie, while guitarist Alex "93" Nejezchleba takes a break from his blazing rhythm riffing every once in a while to rip out an old-school thrash solo. More so than on The Witchhunt, the drums were miked really nicely, each one as clear as if the listener was right in the studio. Even the shorter songs, like Just Be Yourself, pack a crazy amount of action into them, and action is the name of the game here, because there is no break, and barely even a slowdown, in what you get with each track. For all that aggression, though, Master as usual puts a lot of simple but powerful melodies into the songs, especially on the title track, which sports some harmonized soloing in addition. And though most of the rhythms are pure thrash, more traditionally heavy-metal rhythms start creeping into the riffs and beats on the last few songs, especially the last song, Red Alert, a chugging monster laden with guitar solos following Nejezchleba and Speckmann's crunching riffs. They rarely make them like this anymore. For the old-school death metal listener, An Epiphany of Hate is one not to pass up.